Pre-Sale Sold Out. Limited number of tickets available at the door. $7. 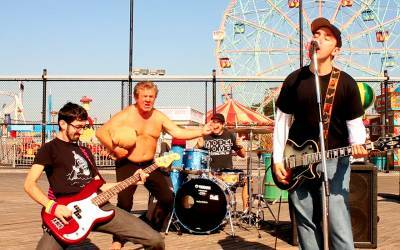 The band Up For Nothing needs money to have fun at Coney Island in Brooklyn, NY. 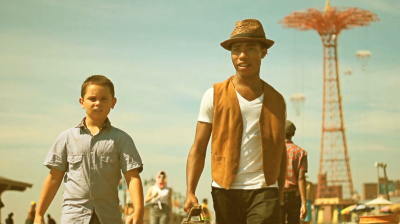 Short Super-8 music video filmed in Coney Island, Brooklyn, for the Austin band Agent Ribbons. The song is about visiting an old friend after being apart. Sander Reijerse, New York, NY. Short, 10:00, Brooklyn Premiere! 'Guy With A Door' is the comedic and emotional journey of the heartbroken Joe, who literally carries a door around to hide his feelings behind. His magical self healing process will lead him to the decision of keeping the door locked forever or finally opening up. Experience an engaging film with remarkable performances from an all New York cast. Shot right here at the cinematic Coney Island beach. Fernando Cuestas, Little Neck, NY, Short, 23:00, New York City Premiere! Based on a true story. It's Coney Island, 1963, say you're with chicken. Set in the music and colors of 1963. Shoe Shine Chicken follows a pair of derelict kids shining shoes on the boardwalk in one of New York most exciting neighborhoods. Coney Island. 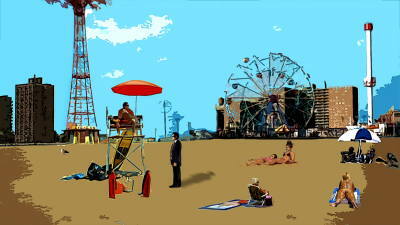 The Undertaker & The Lifeguard is a short satire set in Coney Island over the course of a day that illustrates the exploits of a nefarious undertaker alongside those of an adolescent lifeguard, culminating in a conversation between the two. Some of Coney Island's archetypical characters travel endlessly on the Cyclone roller coaster enduring time and tide. 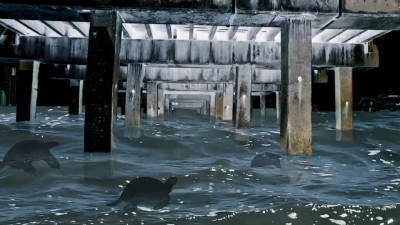 "Coney Island Sinking" is a two-part recurring nightmare about rising sea levels in the neighborhood where I lived as a child. Everything becomes unstable as the ocean moves under the beach turning it into quicksand. Nothing can survive. Finally, the neighborhood begins to collapse as the boardwalk falls into the ocean beneath it. Natalie Berning , New York, NY, Experimental, 8:49, New York City Premiere! If the make up of our world consisted exclusively of creatures and monsters, what would constitute the criteria to be featured in a carnival freak show? Two such individuals escape this fate and struggle together to relate to one another, nourish each other and survive. Universal themes of attachment, love and sacrifice are explored in this 9-minute experimental film. Laura deNey, New Paltz, NY , Doc Short , 19:16, World Premiere! MERMAGEDDON: The Tails of Glory join up with Jaycee Gossett, host of Dance the World, to bring you the best mermaid video EVER! The world did not end as scheduled, but the reign of the mermaids has just begun. 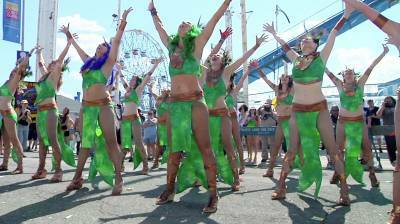 Armageddon or Mermageddon, this romp through Coney Island's Mermaid parade with these hot Mayan Goddesses will make the end of life as we know it seem a lot more appealing.